At the end of May, I had the privilege of hearing the Hon. Justice Senator Murray Sinclair speak to a full house of teachers, parents and community members at Rideau High School in Ottawa on the Critical Role of Education in Reconciliation. While he has challenged audiences across the country with the same message throughout the duration of the Truth and Reconciliation Commission, it is worth reminding ourselves of the gravity of the duty that we as a country possess to ensure that we have indeed learned from this dark history. During the official run of the Truth and Reconciliation Commission, the Hon. Senator Sinclair has been vocal about how education is the key to walking on this journey of reconciliation. He reminded the audience that teachers in particular have a sacred responsibility to ensure that all their children, regardless of their heritage, are able to think about four key questions throughout their education: where do I come from, where am I going, why am I here, and most importantly, who am I? Education systems matter to us as humans, and should be designed to give a child answers to these very basic, yet profound, questions. 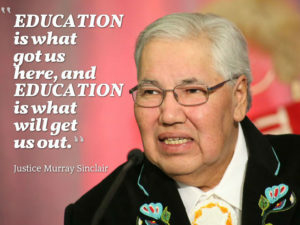 While all children should be able to know about their ancestors and their creation story, their beliefs about the future, and their purpose on this earth, the most important and unending question is “who am I?” Or rephrased, “who or what do I want to be?” It was the failure of the education system through the creation of residential schools and other government policies that deliberately and systematically prevented First Nations, Metis and Inuit children across the country from being able to explore this question. This abuse of the education system has had lasting impacts on many Indigenous people in Canada today, and the Hon. 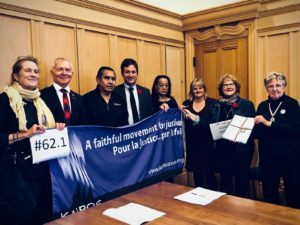 Senator Sinclair referenced the many youth suicides that have caused several First Nations communities to declare a state of emergency in recent months. 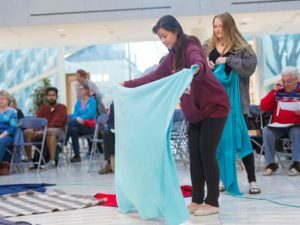 These suicides, and many other issues such as high incarceration rates of Indigenous peoples, can be directly linked to the legacy of a racist and assimilationist education system that has been operating in Canada for over 100 years. He issued a challenge to everyone in that room: if all educators, whether they are parents, teachers, family members, or friends, ensure that they educate children to be able to answer these four questions, we will be part of the reconciliation journey. We must ensure that racism, both overt and covert, is not part of our lexicons and behaviours, and that it has no place in our children’s lives either. This lesson is just as applicable to all Canadians, regardless of whether they are newcomers or not. 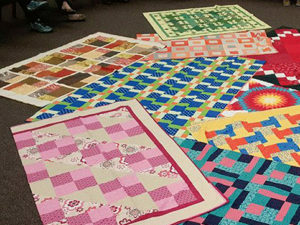 While I am neither a parent, teacher, nor newcomer to Canada, as a facilitator of the blanket exercise, I seek to bring clarity for all participants on the question of “where do I come from” in the context of a Canadian perspective. Sara Anderson is the Reconciliation Education Project Coordinator at KAIROS Canada.